When you download the project, you can just run an npm install, to get all the requirements installed, and get going. If you want to follow along from scratch, read on. Be sure to install the latest Serverless version (npm install -g serverless). We also need a CloudFront distribution to serve our screenshots. This is not supported by Serverless out of the box, so we need to create a custom resource for it. We also define some Outputs, so we can use these later on. Taking screenshots is something that is perfectly fine to do with Lambda. There is no need to setup queuing, batch workers, etc. Lambda can handle the screenshots, thumbnails and storage. Whenever a request comes in, it will automatically spin up, auto scaling to whatever is your need. 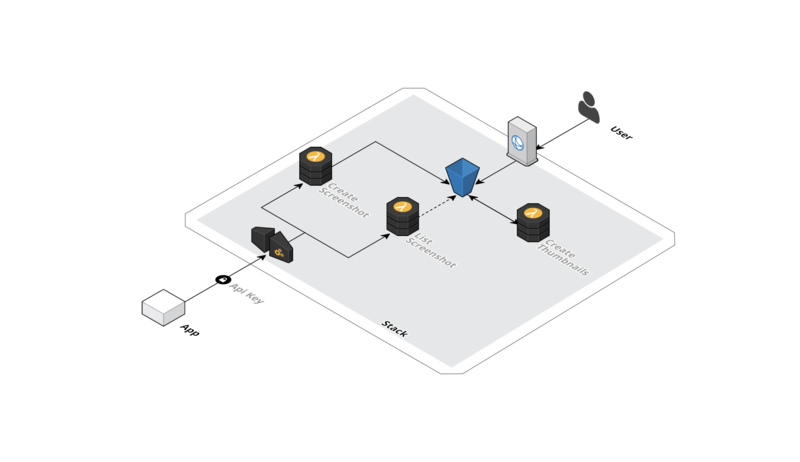 Serverless makes it really easy to setup, configure, and deploy your (micro)services, and now that it’s using CloudFormation, it’s really easy to extend your services with other AWS services you might need in your project.